The Depth Perception Apparatus tests depth perception acuity. Depth perception is the ability to see the world in three dimensions and to perceive distance (the ability to judge which of several objects is closer or farther away from you, or to judge the distance between you and an object). The Depth Perception Apparatus represents the state-of-the-art in sensation and perception measurement te.. The Illusionator Set is used for the study of visual effect illusions. A unique assortment of visual illusion cards is included with the 14015A Illusionator. 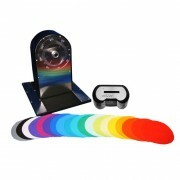 This optical illusion set allows for the demonstration of illusions of depth, angle, tilt, movement and color. 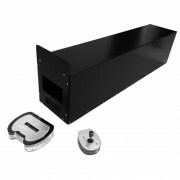 The unit contains a low speed motor (0-8.5 RPM) for the trapezoid rotation illusion, and a high speed motor (0-2350 RPM) for the.. The Light Discrimination Apparatus illustrates the various psychophysical methods (limits, average error, constant stimuli, etc.) used in visual discrimination. By watching the two 1.375” diameter light stimuli while the examiner adjusts light intensity, the subject’s task is to determine when lights are at an equal intensity or when one light is more or less bright than the other. Each stimulu.. The Singerman Color Mixer is used to demonstrate light mixing. Three independent 1.6 Million Color RGB LEDs are included to allow illustrations of primary colors, false primaries, contrast effects, complementary colors, and shadows. 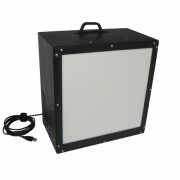 The Singerman Color Mixer consists of a light-tight case with a large milk-glass screen, computer controlled individual RGB LEDs for three-stimulus color presentati.. The Color Mixer is used to demonstrate how the eye combines color surfaces. This basic Color Mixer was designed specifically for the classroom. The color wheel spins the included paper color disks at speeds varying from 0 to 2350 RPM. The 5-inch wheel is marked with degrees so that varied proportions of color can be spun for different effects. The drive motor operates smoothly and quietly. The .. The Card Sorting Box is a test designed to measure total execution time, reaction and movement time, and attentional span. Additionally the equipment can measure sustained attention and concentration through continuous performance task, attentional interference tasks and verbal working memory tasks. The test requires a complex set of skills, such as visual-motor coordination, attention and perf.. The Linear Movement Apparatus can be used for motor learning tasks and assessments of temporal or spatial memory. This device has been used in the studies of motor learning, neuroscience, and motor skill evaluation. The Linear Movement Apparatus consists of an optical encoder that accurately measures the target cube’s displacement. The subject’s task is to project the target cube a specified di.. The Professional Vision Tester is a visual screening and peripheral vision test designed to perform comprehensive visual screening in minimal time. In addition to the ability to screen under a variety of conditions, including monocular, binocular, near, distance, daytime, and nighttime, the Professional Vision Tester can also function as a peripheral vision test. The Professional.. The Portable Screening Audiometer is a precision instrument designed to permit simple, rapid and reliable hearing tests. Their application ranges from school testing programs, pre-employment examinations and monitoring audiometry for hearing conservation programs. The instrument provides all of the pure tone frequencies and full dynamic range specified by the American National Standards Institu.. The Portable Diagnostic Audiometer is a portable, one-and-a-half-channel audiometer, offering pure tone audiometric testing (air and bone conduction screening). The added depth of bone conduction takes it one level above the Portable Screening Audiometer. It performs tests using TDH 39 headphones, a B-71 bone conduction receiver or optional insert phones. Built-in test signals include pure tone.. The Portable Diagnostic Audiometer is a stand-alone audiometer with pure tone, speech and free field audiometric testing. It is designed for ENT diagnostics and hearing aid fitting in the office, and for mobile audiometry. Its ergonomic design and comfortable handling allow a user-friendly operation. TONE AUDIOMETRY The Portable Diagnostic Audiometer performs tests using a.. The Portable Diagnostic Audiometer is a two-channel audiometer with pure tone, speech and free field audiometric testing as well as Master Hearing Aid. It can be used for ENT diagnostics and hearing aid fittings in the office, and for mobile audiometry. TONE AUDIOMETRY The Portable Diagnostic Audiometer performs tests using air conduction headphones, bone conduction re..